Looking for a nice mid-range device? The Heatvape Defender 50W Mod is the new-and-improved version of the original Heatvape Defender. It now offers up to 50W (vs. 25W) and is powered by an external 18650 battery so you can swap it out whenever it needs to be replaced. It’s extremely compact, offers plenty of power and can fire atomizers down to 0.3 ohms – perfect for all of the latest sub-ohm tanks. It has OLED screen, spring loaded 510 and various built-in safety features. 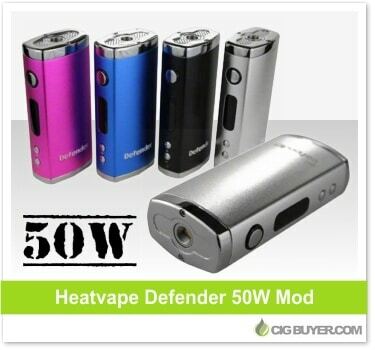 Heatvape Defender 50W Blowout – ONLY $14.95!